Uh, Oh! Karl, et. al., is bad news for Stefan Rahmstorf’s sea level rise rate. When the 20th century GISS temperature is modified according to Tom Karl, et.al., it causes the 21st century sea level predictions of Vermeer’s and Rahmstorf’s semi-empirical model to go down! I have written extensively about “Global sea level linked to global temperature,” by Vermeer and Rahmstorf (which I will refer to as VR2009). VR2009 was a widely cited claim of using historical 20th century sea level and temperature data to calculate parameters that could be used to build a model to predict 21st century sea level rise for various 21st century temperature scenarios. I reproduced the VR2009 model based on their description. My code was verified by reproducing the VR2009 results using the same inputs that they used. I spent a lot of time pointing out some of the bizarre results of their model that surely disqualified it form being taken seriously, some of which can be seen here, here, and here. I also spent a lot of time pointing out that the VR2009 choices of 20th century sea level data sources left much to be desired. For example, they used the 2006 Church and White sea level data that was already outdated. If they had used the revised Church and White data, then their resulting sea level rise predictions for the 21st century would have been much lower. They happily modified Church’s and White’s outdated sea level data by subtracting a reservoir correction (Chao, et. al. ), which made their 21st century predictions for sea level rise go up. But they made no attempt to estimate a groundwater depletion correction. It turns out, unsurprisingly, that the groundwater depletion is of the same magnitude as the reservoir correction (Wada, et. al. ), and including it would have made their 21st century predictions go down. Nevertheless, Rahmstorf would later claim that his modeling approach was “robust!” That is, it would give essentially the same result for the 21st century given different sources of 20th century sea level data. So, I also implemented the VR2009 technique using several different sources of sea level data, which should have given similar results, according to Rahmstorf’s claim of robustness. In fact, they gave widely varying results, and every combination of sea level data, reservoir data, and groundwater depletion data that I tried gave lower results than VR2009’s chosen combination. The widely reported nearly two decade long pause in global warming was causing suicidal ideation among hard-core global warming alarmists. Something had to be done to stop them from slitting their wrists with shards of glass from their shattered thermometers. Just in the nick of time – revised temperature data! Like all proper revisions of temperature data, this revision caused the reported temperature change of the 20th century to go up. This was a result of a paper by Tom Karl, et. al. (Nature) based on very thin reasoning (see for example) that argued for such revision. The folks at GISS (who provided VR2009’s temperature data) glommed onto Karl’s logic and subsequently revised their temperature data accordingly. 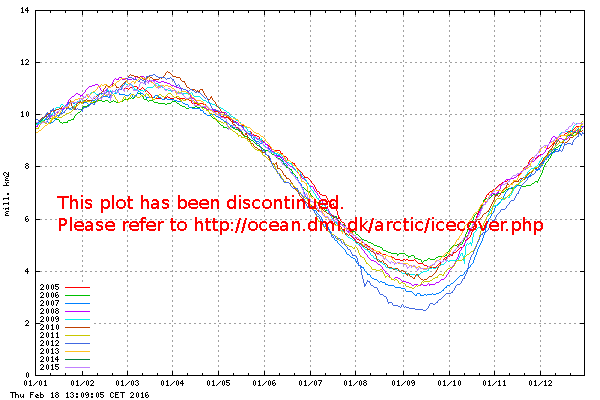 Other temperature data source like UAH and RSS did not. Which means we must ask ourselves, what happens to 21st century sea level rise predictions based on the VR2009 model using the now modified GISS data? VR2009 applied their model to six families of temperature scenarios for the 21st century form the IPCC’s 4th Assessment Report. Let’s see what happens to each of those scenarios when we update the 20th century GISS temperature data. 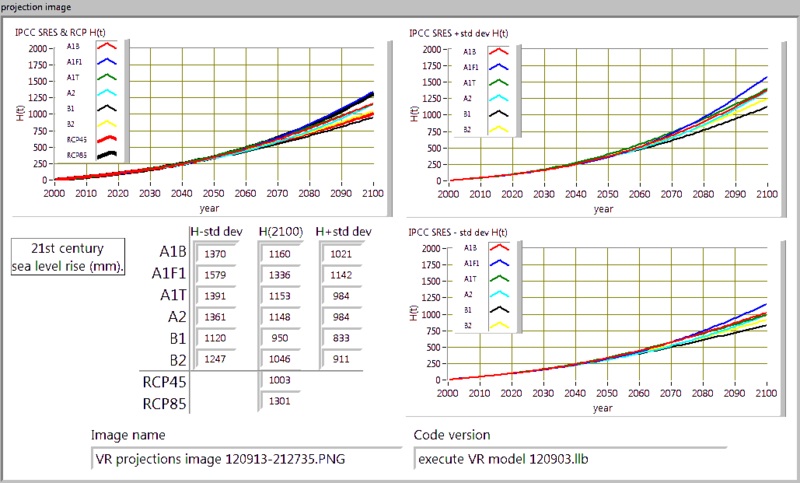 The IPCC temperature scenarios that VR2009 used for prediction of 21st century sea level rise. 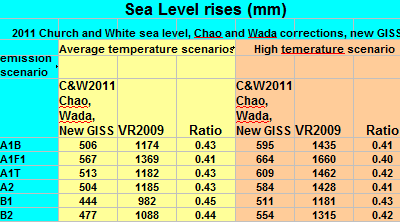 Sea level inputs are identical to what VR2009 used: Church’s and White’s sea level with the Chao reservoir correction. The old GISS temperature data is replaced with the new GISS temperature data. The table below shows that the new GISS data yields 21st century sea level rises that are about 17% less than when the old GISS data is used. It is a shame that after Tom Karl went to all the trouble to increase the temperature rise of the 20th century it just makes VR2009’s model predict LOWER sea levels for the 21st century. This must be a great disappointment to Vermeer and Rahmstorf, so you can be pretty sure they will never tell you this result. But I just did. As I pointed out previously, VR2009 chose to use outdated 2006 Church and White sea level data, instead of Church’s 2009 data. They also neglected a groundwater depletion correction. When these improvements are included the VR2009 model yields 21st century sea level rises that are only about 55% of VR2009. When the new GISS temperature data is included in the mix this drops to about 45%. Lest Vermeer or Rahmstorf argue that their large sea level rise rates are saved by another update of the Church and White data in 2011, I have include these results also. The difference between 2009 and 2011 Church and White sea level data was small. Here is how the 2011 Church and White sea level data version plays out in the VR2009 model. The resulting 21st century sea level rise predictions are only about 43% of the VR2009 predictions. 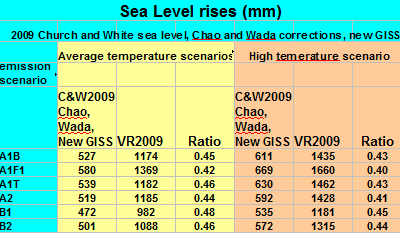 It seems that no matter what combination of inputs that are used in the VR2009 model, the predicted sea level rise for the 21st century is always smaller than with VR2009’s choice of inputs. I wonder what that implies? Vermeer and Rahmstorf had a paper rejected by the journal “Climate of the Past.” This news is 16 months old, but I just heard about it, and could find very few references about it on the web. This paper, On the differences between two semi-empirical sea level models for the last two millennia, promoted their earlier sea level rise models. They couldn’t seem to get traction with this paper. One of the major problems with this work is the decidedly biased analysis and presentation. Highly biased analysis and presentation. It currently takes signiﬁcant effort to ﬁgure out which pairs of models and training data sets the authors use, and whether they have evaluated all the relevant combinations of the same. No surprise here. Rahmstorf has a history of alluding to all kinds of data sets and implying that he has taken them into consideration, but only presenting results for those that support his thesis. In the light of the two negative reviews and one comment which all require new analyses and point to fundamental ﬂaws in the methodology of the current paper, I regret to inform you that my conclusion is to support rejection. I strongly dissuade the authors from submitting responses and a revised version. Here is the reviewers’ discussion that lead to the the rejection. This is part 4 of a multi-part series about “Testing the robustness of semi-empirical sea level projections,” Rahmstorf, et. al., Climate Dynamics, 2011. You can see an index of all parts here. I frequently refer to this paper as R2011. I will refer to Stefan Rahmstorf’s ”Testing the robustness of semi-empirical sea level projections” as R2011 . 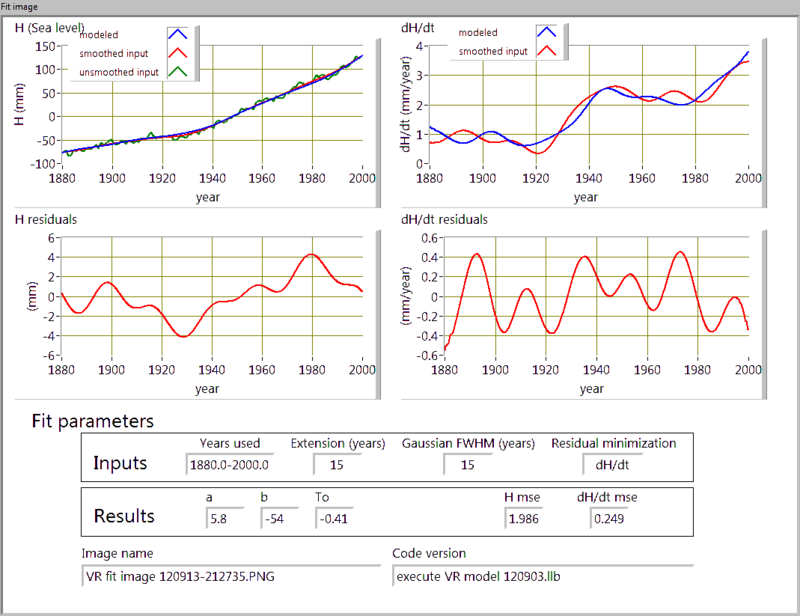 The new code for consistent processing of temperature and sea level data according to the predominant Vermeer and Rahmstorf 2009 model (VR2009) is complete. It is written LabView V7.1. There have been several upgrades to LabView since V7.1, but I believe my code will open in any of them. I prefer this older version of LabView for a variety of reasons that I will not go into here. But one advantage is that anyone who is interested in running this code can find a used student version of LabView on Ebay at a very reasonable cost. My code can be downloaded here. Rahmstorf and company figured that once a, b, and To were found they could insert hypothesized temperature scenarios for the 21st century into equation 1 and calculate the resulting sea levels. I have provided a long list of criticisms of their logic. One of the most devastating observations is that their own source of 20th century sea level data(Church and White, 2006) had revised their data, and the new version of data (Church and White 2009 or Church and White 2011) resulted in much lower sea levels by the end of the 21st century when inserted in to equation 1. Two years ago I reproduced the VR2009 fit parameters, a, b, and To, to demonstrate that I could accurately reproduce their model. In R2011 Rahmstorf re-works the numbers with the same inputs used in VR2009, and I have reworked the numbers with this new code. And for the same inputs used back on VR2009, everything lines up within Rahmstorf’s stated uncertainties. But that is a minor point. Rahmstorf’s primary objective in R2011 is to defuse my observation that Church’s and White’s newer, more accurate sea level data causes Rahmstorf’s model to yield much lower sea level projections for the 21st century. Plenty of time to deal with that issue later. In R2011 Rahmstorf presents slightly different numbers than he did in VR2009 for the same input conditions. Similarly, with my new code I now get slightly different numbers for the same input conditions. I will also be presenting a lot of results for different possible inputs in the days to come. But my results will be very detailed, complete, and entirely open for your examination. You also have access to my complete code. My code will always generate four files for any set of inputs. 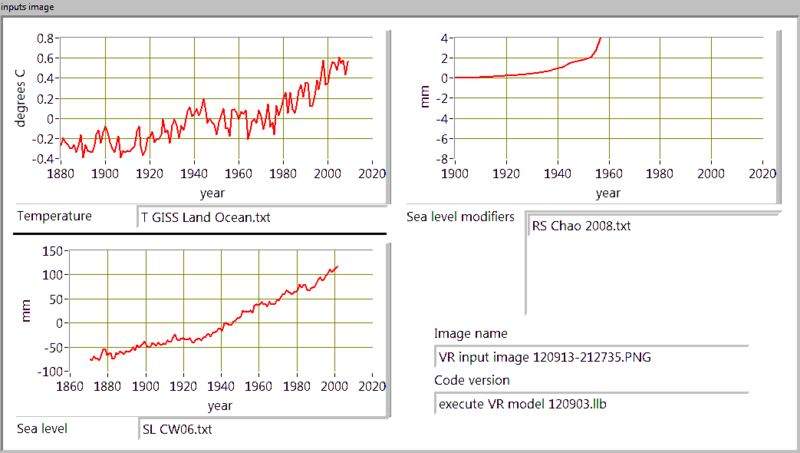 Three of those files are images of: graphs of the input data; graphs of the model fits to the input data (used to derive a, b, and To); and graphs of sea level projections based on various temperature scenarios for the 21st century, including the SRES emission scenarios used in VR2009 and the RCP45 and RCP85 scenarios used in R2011. The fourth file is a tab delimited text file with all setup parameters, fit plots and results, and projections. Note that the graph images of the 21st century sea level projections will not be autoscaled. That is, the Y axis of the projection graphs will all have the same scaling. This will make many of the graphs look crowded, but it will also be easy to make a qualitative comparison of the projections from different input data. You can always open the tab delimited text file in the spreadsheet of your choice and replot the data as you see fit. Below you can see an example of the graph images and the corresponding tab delimited text file that is generated by my code with the same input data used to find the model fit parameters listed above. That is, I will use the GISS temperature, Church and White’s 2006 sea level data and the Chao reservoir correction, which result in my values of a, b, and To, shown above. The tab delimited text file is shown below. I have truncated the columns of data (which could be thousands of rows long). The headers and columns would line up better if you opened the file in a spreadsheet. This is part 3.5 of a multi-part series about “Testing the robustness of semi-empirical sea level projections,” Rahmstorf, et. al., Climate Dynamics, 2011. You can see an index of all parts here. I frequently refer to this paper as R2011. I have finally published my small library of temperature, sea-level and sea-level modifier (reservoir storage, groundwater depletion, etc.) data from various sources. All of these data files have a consistent format which can be read by my code that calculates fit parameters for the Rahmstorf model relating sea level to temperature. However, not all of the time series are long enough to be useful in that model. You can see the data files here. I am open to suggestions for additions to this list. If you have any criticisms of the files, such as accuracy of the data, format, selection, anything – please leave a comment. I will give due attention to any legitimate criticism that is aimed at improving the data. I am a slow worker, but I try to be thorough. The first output from my code, using Rahmstorf’s preferred inputs (GISS temperature, Church and White 2006 sea level data, and the Chao reservoir correction) will be presented soon. The goal of that presentation will be two-fold: to verify that of my model implementation are consistent with Rahmstorfs; to have a simple format for presenting those result. That format can then be applied to the results of other input data. This is part 2 of a multi-part series about “Testing the robustness of semi-empirical sea level projections,” Rahmstorf, et. al., Climate Dynamics, 2011. You can see an index of all parts here. I frequently refer to this paper as R2011. I will refer to Stefan Rahmstorf’s “Testing the robustness of semi-empirical sea level projections” as R2011 . This post is all about fitting sea level data to a quadratic. There is only one reason to fit sea level vs. time data to a quadratic: to highlight an acceleration trend. It only makes sense to do so if you think that the trend is more or less uniform over time. I have warned against reading too much into a quadratic fit, and especially against using a quadratic fit to imply a future trend in sea level. The point the R2011 wants to make, of course, is that all of these data sets have the same acceleration trend as R2011’s preferred sea level data, CW06. But that is not true. In fact, if you fit any of the other data sets to a quadratic you will see that every single one of them has a lower trend than CW06 when projected through the 21st century. Every single one of them. 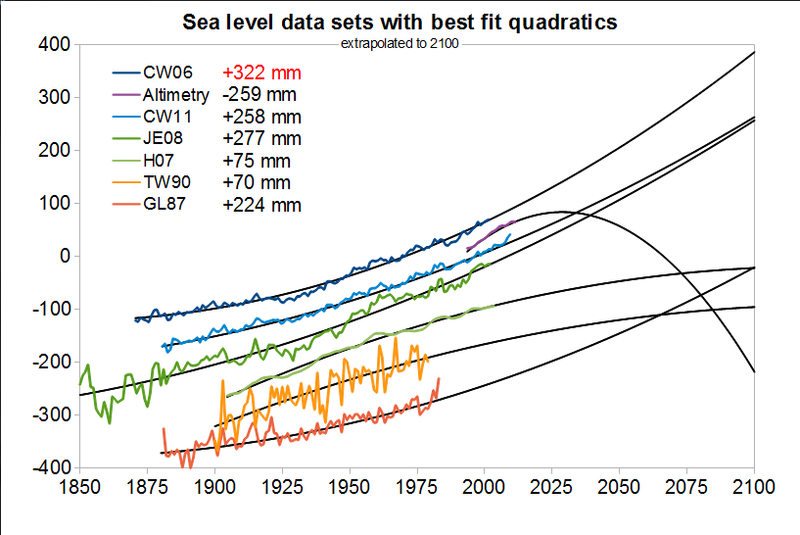 The following figure shows proper quadratic fits to all the sea level data sets used by R2011 in their figure 1. The legend shows the sea level rise that would result for the period 2000 to 2100 if these quadratics were extrapolated to 2100. Science is about constant refinement of theories and data. When Rahmstorf is faced with old data and new data from the same authors, he has a special method for deciding which data set is better. The version that points to higher sea level rise in the 21st century is always considered to be better. Thus his insistence that the 2006 Chuch and White sea level data is better than the 2009 or 2011 Church and White data that incorporated Church’s and White’s data reduction improvements. Holgate data from 2004 has been replaces with Holgates updated data from 2007. Let me stress again, I do not recommend extrapolating sea level data with quadratic fit, and I am not endorsing any of the extrapolations shown above. I am simply guffawing at Rahmstorf’s chuzpa in his figure 1. This is part 1 of a multi-part series about “Testing the robustness of semi-empirical sea level projections,” Rahmstorf, et. al., Climate Dynamics, 2011. You can see an index of all parts here. I frequently refer to this paper as R2011. I don’t get many readers at my little blog, but it is nice to know that Stefan Rahmstorf has been keeping up with it. He has a great desire to prove that his claims of extreme sea level rise, and my comments (and equations, graphs, data, logic, etc.) have cast his conclusions into grave doubt. Besides showing in multiple ways that his models don’t make mathematical sense, I have also shown that when the best data is applied to his (bogus) model his sea level rise projections for the 21st century are cut down to size. So, it seems his recent outing in Climate Dynamics (“Testing the robustness of semi-empirical sea level projections,” Climate Dynamics, November, 2011) is aimed squarely at that point, which he makes clear in the fourth sentence of the abstract. You see, once upon a time (2007, 2009 ) Rahmstorf thought that the 2006 version of sea level data from Church and White was surely the finest data for figuring out the relationship between sea level rise rate and global temperature. When he used it in his silly 2007 and 2009 models to project 21st century sea level rise, the models gave alarmingly high results. Ergo, the models and input sea level data must certainly be correct. The problem was that Church and White were not as confident in their own sea level data as Rahmstorf was. By the time Vermeer and Rahmstorf were penning their widely quoted 2009 PNAS paper, Church and White had made serious corrections to their sea level data. But that corrected data never made it into the Vermeer’s and Rahmstorf’s paper. If it had, their sea level rise projections would have been way lower. I raked Rahmstorf and company over the coals on this point. I ran their own model with the corrected data from their own source (Church and White) and published the results online. 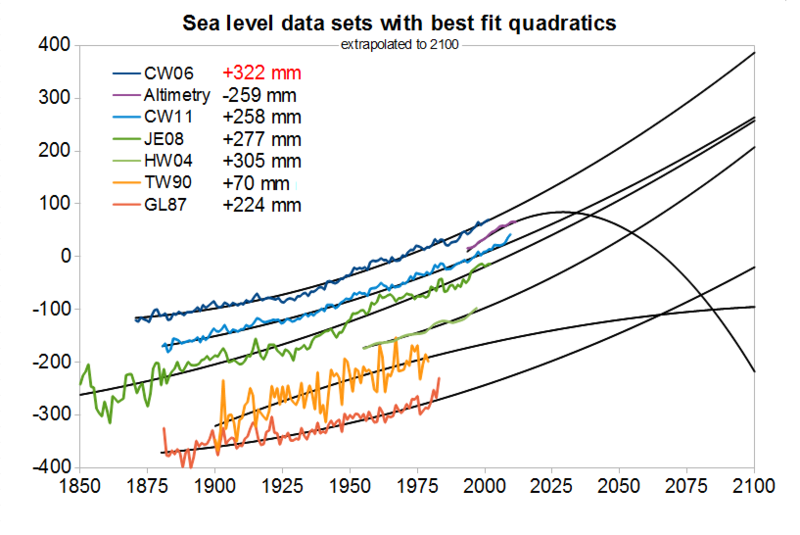 The result: vastly lower sea level projections for the 21st century. Their response: silence. As is my custom, I will write a series of posts concerning “Testing the robustness of semi-empirical sea level projections.” Stay tuned. The following video shows all the PSMSL tide gauge data so you can search for a sea level rise acceleration. 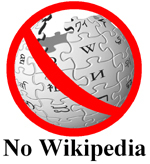 It replaces an earlier version that was taken down by youtube because of music license violations. This version has music with Creative Commons license. The text and data are the same as before. 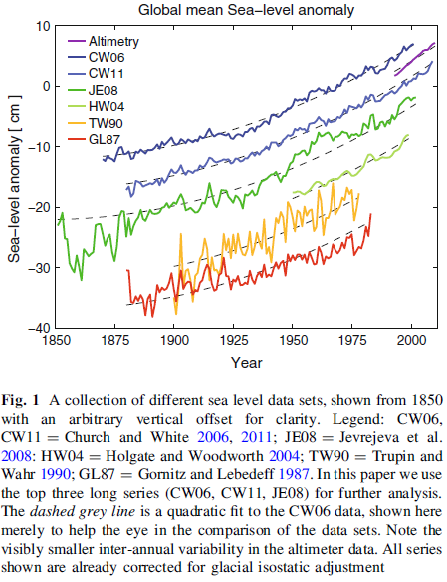 Vermeer’s and Rahmstorf’s “Global sea level linked to global temperature” (PNAS, 2009) relied on Church’s and White’s “A 20th century acceleration in global sea-level rise” (GEOPHYSICAL RESEARCH LETTERS, VOL. 33,) for their sea level data. Church and White built their sea level time series from the Permanent Service for Mean Sea Level (PSMSL) tide gauge data. There is no attempt to analyse the data here, but I have started that process and will report on it later. The first two minutes may be a little boring, but please read along. It livens up later. For now, sit back and enjoy.